I was reading a post over at Financial Hack today about Giving up alcohol for cash where Beks writes about how much she likes Bud Extra and that she is thinking of not buying it any more in order to save money. Even though her local liquor store doesn’t sell Bud Extra it is nice enough to specially order her the 2 cans a week she usually buys – that’s how much she likes it! By not buying the 2 weekly beers she would save $3.25 a week (or $13 a month). While it might not feel much, things like that can add up – she spends $156 dollars on her favorite beer a year. If you manage to find a few other similar weekly expenses and cut your spending it would be possible to save over a thousand dollars a year. In theory it seems like a great plan. In practice – I have a difficult time believing it will work. There are some things that are just too good to give up. If you are willing to go through the trouble of ordering yourself 2 cans of beer weekly – then it seems obvious that this is of those things. Why I spend my money on beer? I can relate to Beks story because I too buy exactly 2 beers a week – not Bud Extra but a local brand no one outside Estonia probably knows. It tastes great – especially after my workout. I usually have 1 beer on Monday and 1 on Wednesday after I get home from my soccer practice. While drinking the beer is not a rule I always follow – it is a habit that I have picked up over time and have grown to love. There just isn’t anything better as being exhausted from my workout, grabbing a cold beer and drinking it to quench my thirst. It tastes like a piece of heaven! This is a habit that I thoroughly enjoy but one that I could easily get rid of – but won’t. Some things are just too good to give up. 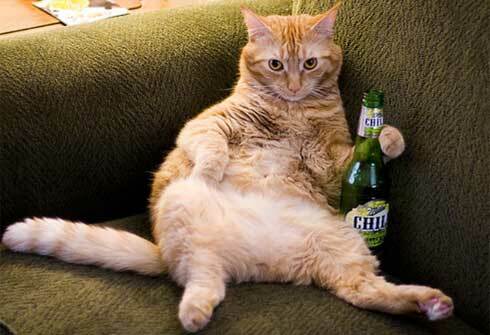 As you see below – even cats like beer! People are not robots – we need certain things to keep us going and to keep us happy! Having a beer after my soccer practice is just that – something that lets me enjoy life. Little things like this make all the difference. The nice thing about this little thing is that it doesn’t cost much as well. The extra 156 dollars a year that I would save when choosing not to buy beer is not enough to make me give up something that makes me enjoy life! If I would need to choose between being unhappy for a year or spending $156, it would be a no brainer – I would spend the money. If you have been reading this post and are thinking that the point I am trying to get across is that drinking beer is good then I am afraid I haven’t made myself clear enough. My point is this – everyone has a few things that make their life a lot more worthwhile. If possible, don’t give these things up for exchange of more money – this will only make you feel bad. Why should you want to become a millionaire when all the way to your first million you can’t do the things that you enjoy most in life? Spend money on some of the little things that make you happy and you will have a lot more energy and willpower to truly save money where it actually matters. It’s a matter of choice. Some things are just too important to give up. For more advice on where to save and where to spend – sign up to our full feed RSS or subscribe via email. The problem is discerning what is something that qualifies as “too good to give up”, and what does not. It’s no different than the classic question of “want” versus “need”. People are in essence herd animals – we need a leader, we need to follow someone. In any group there are less leaders than followers – although I believe that admitting that you are a follower is the first step towards becoming a leader! Ok, you are so right. I’m not giving up the beer! I like it too much! I drink around 14 beers a week. I can easily give up 2 a week…actually maybe your right – somethings are too important to give up. This makes 624 beers a year…. That’s a lot when you think that way! mention non-profit businesses that give similar services. work with the help of them.